Get ready to bring some giant robot and alien action to the comfort of your home, as Pacific Rim Uprising is coming to Blu-ray, 4K and digital platforms this June. Universal Pictures has announced that Pacific Rim: Uprising arrives on digital, as well as the Movies Anywhere app on June 5, 2018. The movie will arrive on 4K Ultra HD, 3D Blu-ray, Blu-ray, DVD and On Demand two weeks later on June 19, 2018. The sequel takes place ten years after the events of the first movie. the Kaiju return in Uprising with a new deadly threat that reignites the conflict between these otherworldly monsters of mass destruction and Jaegers, the human-piloted super-machines that were built to vanquish them. The home video release of Pacific Rim: Uprising is loaded with special features. It includes deleted Scenes with Commentary by Director Steven S. DeKnight. The release also includes a commentary track from director Steven S. DeKnight. Pacific Rim: Uprising will be available on 4K Ultra HD in a combo pack which includes 4K Ultra HD Blu-ray, Blu-ray and Digital copy of the movie. The 4K Ultra HD disc will include the same bonus features as the Blu-ray version. All of these versions will include a bunch of featurettes, which are described as follows. Hall of Heroes: John Boyega takes us through the awesome weaponry and cutting-edge enhancements of the latest generation of Jaegers featured in the film. Bridge to Uprising: The cast and crew discuss how the world of Pacific Rim has changed in the ten years since the events of the original film. Becoming Cadets: Step into the Shatterdome, and learn the grueling physical and mental preparation required of the young actors who portrayed the PPDC cadets. Unexpected Villain: Learn the secret reason that turned one of the most beloved heroes of the original film into a villain obsessed with humanity's destruction. Next Level Jaegers: The cast and crew discuss the amazing technological advances of the Jaeger program in the years since the events of the original film. I Am Scrapper: Actress Cailee Spaeny shares the backstory of Scrapper, Amara's incredible self-built Jaeger and its many unique abilities. Going Mega: Filmmakers take us through the technical and creative challenges of creating the most deadly threat the Pan Pacific Defense Corp has ever faced, the Mega Kaiju! Secrets of Shao: Meet the woman behind Shao Industries. Actress Tian Jing shares her insights on the enigmatic tech tycoon Liwen Shao. Mako Returns: Actress Rinko Kikuchi and director Steven S. DeKnight explain the significance of Mako Mori's return and her importance to the events of Pacific Rim Uprising. For those who enjoyed Pacific Rim: Uprising, it looks like the Blu-ray release will have enough on it to justify picking it up. Though, this movie doesn't seem to have as many fans as Guillermo del Toro's first movie did. Currently, the sequel is sitting at a 43 percent approval rating on Rotten Tomatoes from critics, with just a 48 percent audience rating to go with it. That, unfortunately, had an impact on the box office as well. 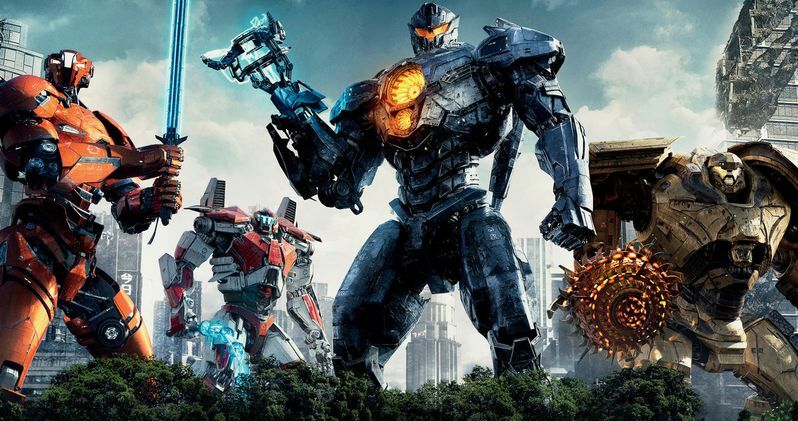 To date, Pacific Rim: Uprising has made just $281 million worldwide working from a massive $150 million budget. That's far less than the original made in 2013. Steven S. DeKnight and the studio had some potentially lofty plans for more sequels and even possibly a cinematic universe of sorts built around Pacific Rim. That all hinged on whether or not this movie did well and, based on the numbers, it doesn't look like that's going to happen. You can check out the Blu-ray box art, courtesy of Universal Pictures, for yourself below.